They’ve made it! 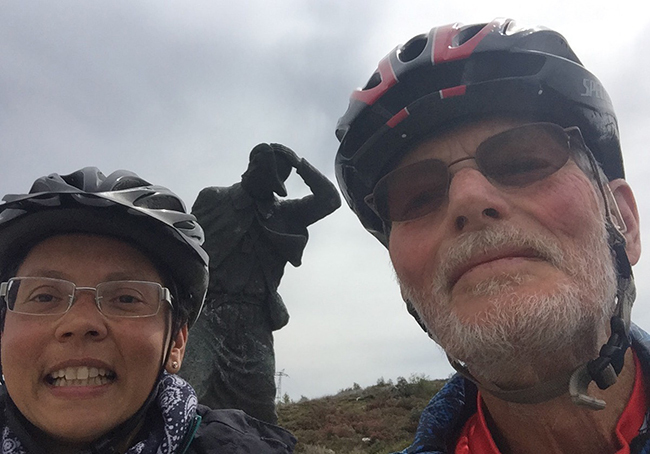 Steve Bradish and Lidia Gazola have cycled 1,000km along the Camino de Santiago. During the last five days they tackled gruelling climbs, were overtaken by peligrinos on electric bikes and finally collected their certificates of completion. 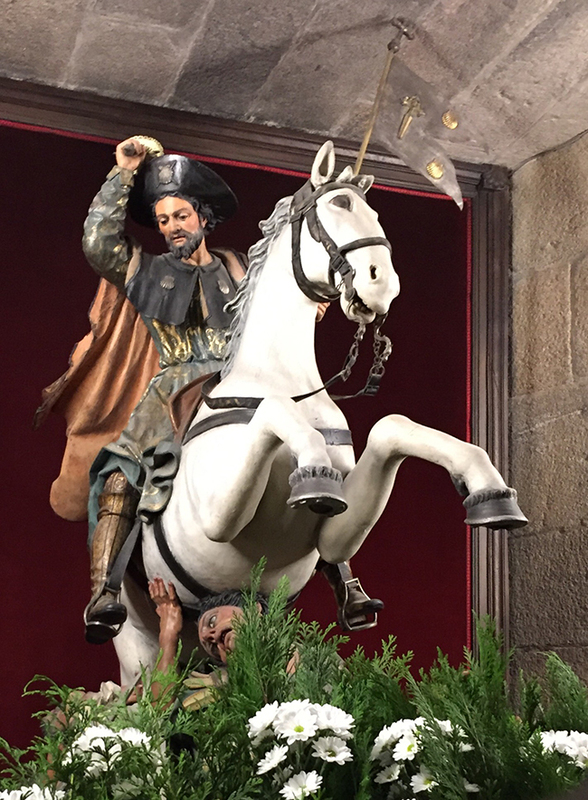 Steve writes: “I went out at 8:30pm to give Mansilla another chance. Finally found a bar with some people in it. Had an excellent 1906 Galician beer and ordered a couple of tapas. When I asked for a third, the bartender said they only come with the drinks. Can’t buy them. I was about to leave and an obvious peligrino came in, so we struck up a conversation and I had a tinto and another tapa. 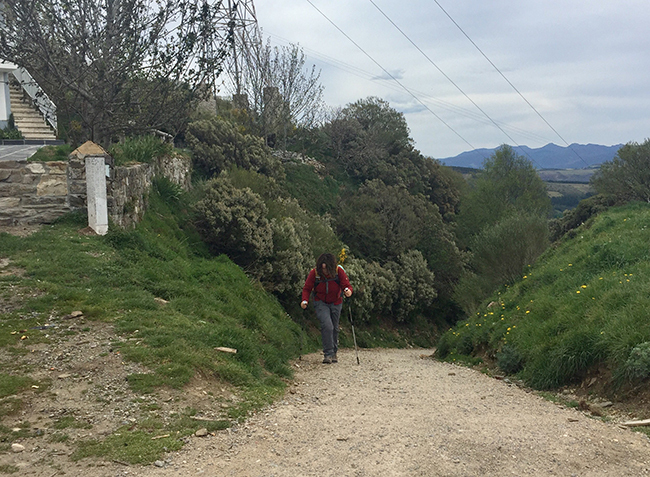 He’s Austrian and has been on the Camino since mid-April. He was a police chief. When he orders wine he wants wine that has been in an oak barrel. The bartender replied that all our wines have been an oak barrel. 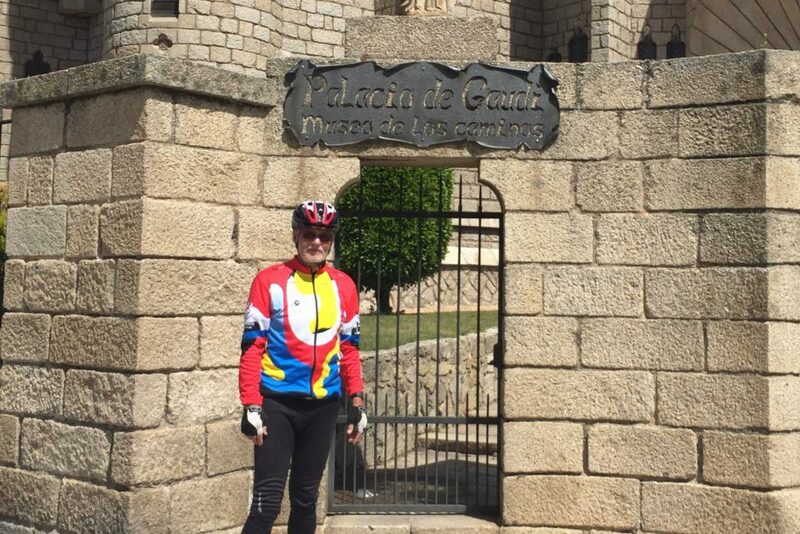 Steve writes: “Before today’s leg, a note about León’s name. It was Le-gi-on and the name got shortened. It was Roman legion outpost where they prepared for attack on Galicia. 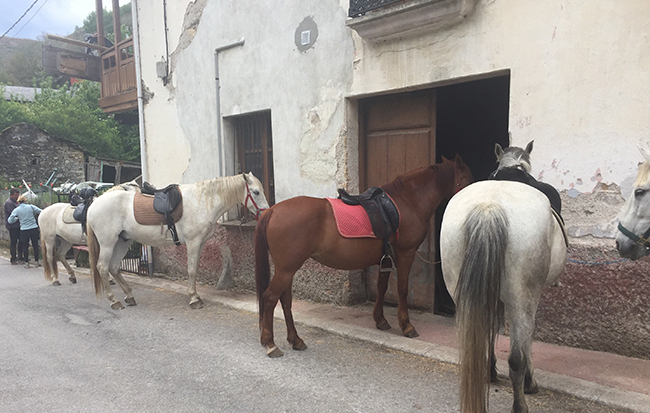 “Off at 8 this morning, bye to charming santa Catalina at 870 metres. A gradual, but steady climb took us all the way up to 1,500m. 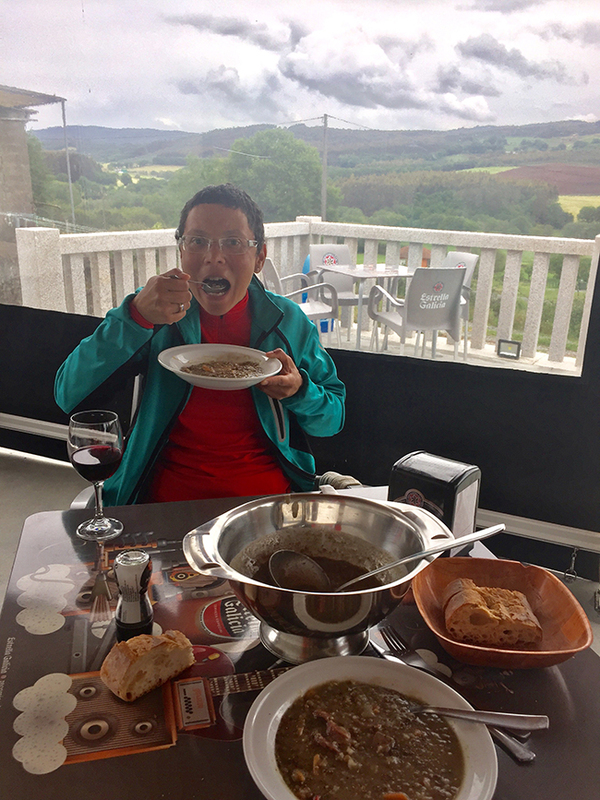 This was followed by a hair-raising plunge of 15 or more kilometers and a 1,000m drop to Molinaseca which is at 550m, 400m below the Meseta Alta on which we’d been riding since Burgos. On to Ponferrada, a fair-size city with nuclear plant. 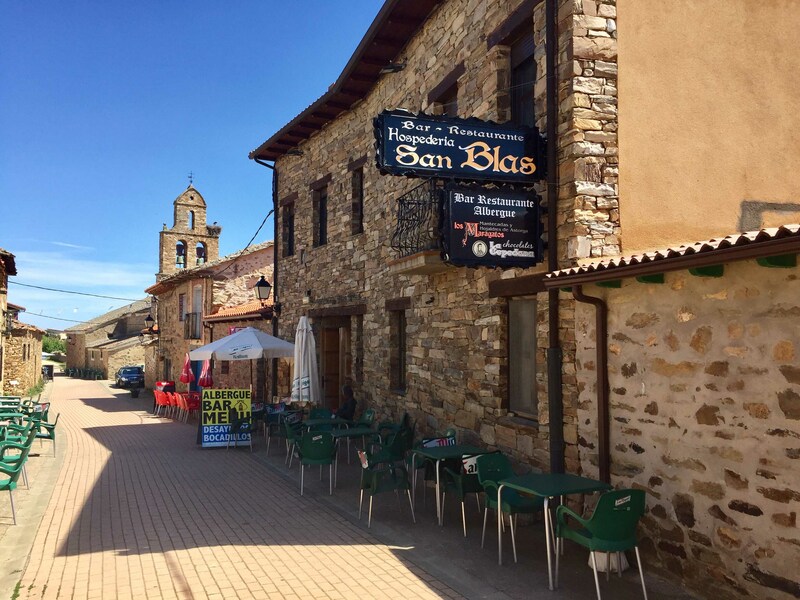 We then took to the Nacional VI to Villafranca del Bierzo where we found a charming albergue in an old restored building. Electric plugs at every bed, whoopee! It’s a nice town but there are many buildings in need of restoration. Steve writes: “It rained a lot overnight and, when the rain stopped at 6, we decided to start early. As we passed Portomarin we saw there were only 104km to go and suddenly there were many more pilgrims. 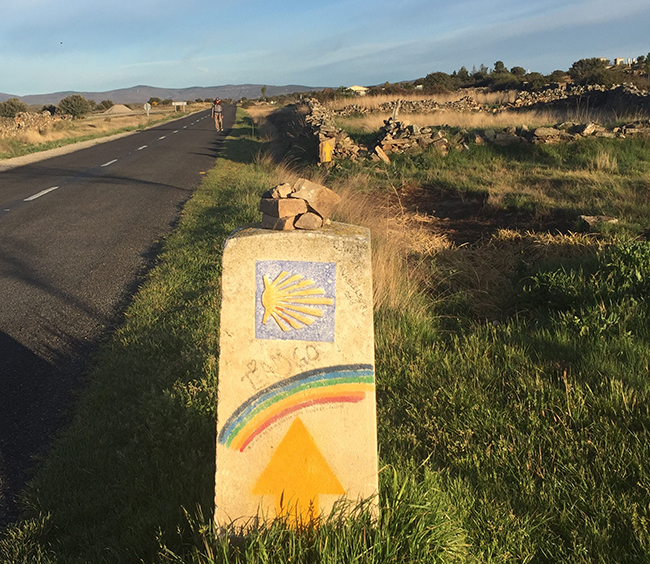 If you walk only the last 100km you can still get your Compostela certificate. Climbing out of Portomarin, we were smartly passed by two pack-less women riding serenely up the hill on their electric bikes! Today had a lot of up and down through beautiful Galician dairy country. We went 12km beyond plan because it had held off raining all day and we won’t be so lucky tomorrow. We’re in Milpes albergue: private, nice and modern, 10 euros, and full up now with 10 in our room in double bunks. 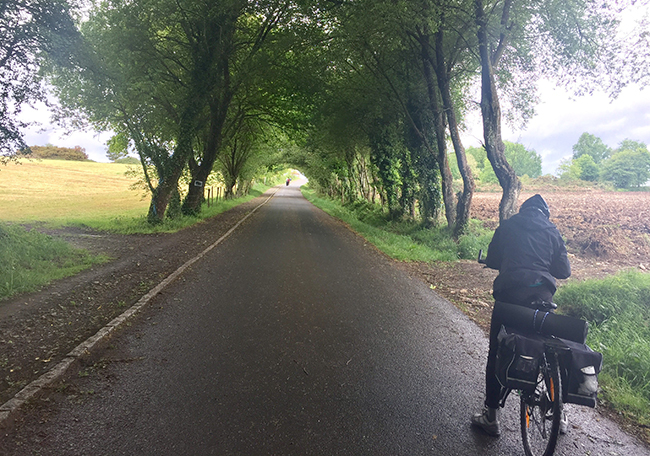 Just 42km to Compostela: we’re smelling the finish line! 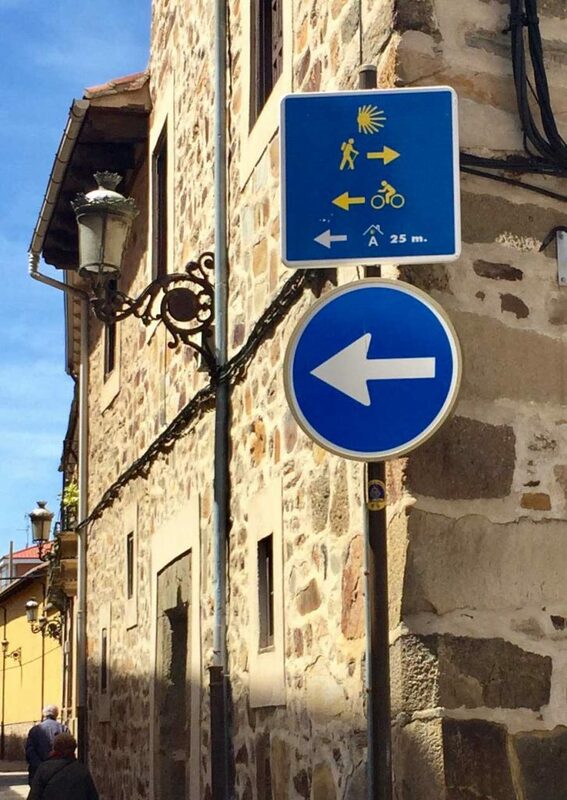 Steve writes: “Well, we did it: 1,050km from Tortosa to Santiago de Compostela. 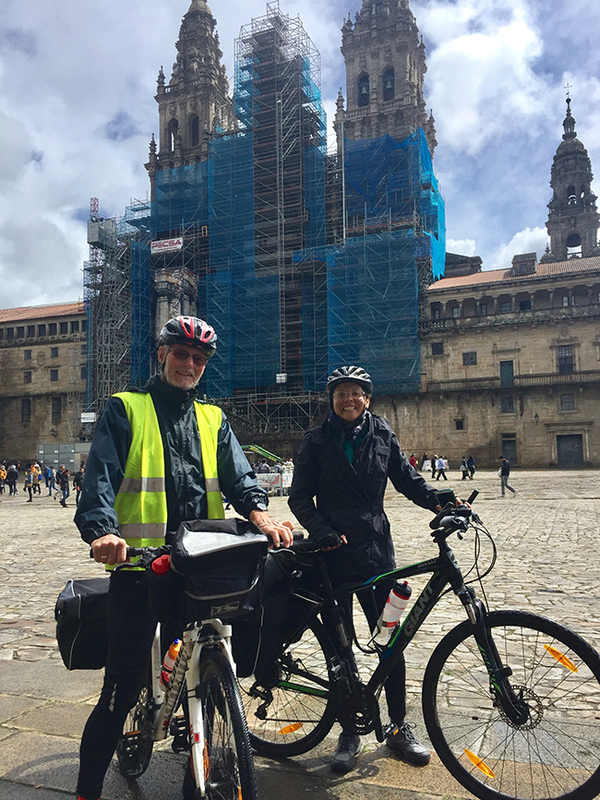 It was beating down with rain for over three hours but it let up a little when we arrived at the cathedral in Santiago. The office for getting the Compostela certificate is very organised with 10 counters. 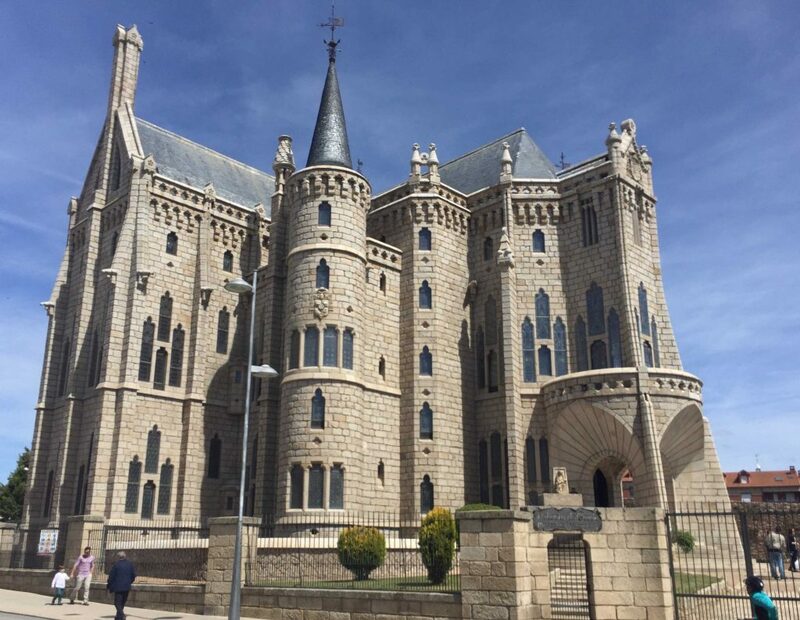 We left our bikes and most of our gear with MRW for delivery in Perelló, and we have booked a flight back for tomorrow.